The sample code above is perfect for telling all web crawlers to go away, which is what they wanted for the development site. The problem was the team transferred all the files from the development server to the production server and they overwrote the previous robots.txt file. After awhile, the site pages started dropping from the search engine results. The robots.txt file is an optional file that provides guidance to web crawlers or spiders about your domain. Reputable bots, such as the major search engines, use this file for determining which content to crawl or ignore. For us non-technical people, looking at either Google’s or Bing’s instruction file can be intimidating. The bottom line is if you’re not careful with this file, you could block your “money” or “important” pages from the search engines. Instead of guessing if your web pages will get blocked, I like to have Google tell me who passes and who fails before their first crawl. They have a free test tool where you can paste in a URL list and see the results. 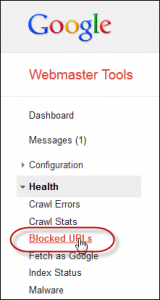 This does require you have a webmaster account, but the service is free. The first step is to create a text list of the URLs you wish to test. This might be your entire site or maybe just your important pages. Alternatively, you can enter in anything including non-existent URLs to learn how the system works. For example, I needed to test a series of URLs for a site that was redoing its URL structure. If you want to test with real URLs from your site, Google has assembled a list of tools at https://code.google.com/p/sitemap-generators/wiki/SitemapGenerators. 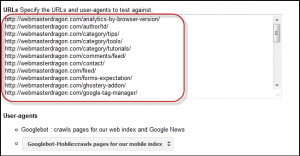 While these tools are designed to create sitemaps, some tools such as GSiteCrawler also create a simple URL text file. If the program you select doesn’t create a simple URL list, you can export to a CSV or tab delimited file and remove any columns you don’t need using Excel or another spreadsheet program. In a worst case scenario, you can test 1 URL at a time, but I find that takes too long and leads to boredom. From the left column, click Health and then Blocked URLs. The screen will show your current robots.txt and the last time it was downloaded. You can also edit your robots.txt file within this window. I’ve outlined my current file in red. If you don’t have a robots.txt file, the search engines will crawl all pages it has discovered that don’t require a password. For example, the search engines may have discovered pages on your site from other websites you don’t control. 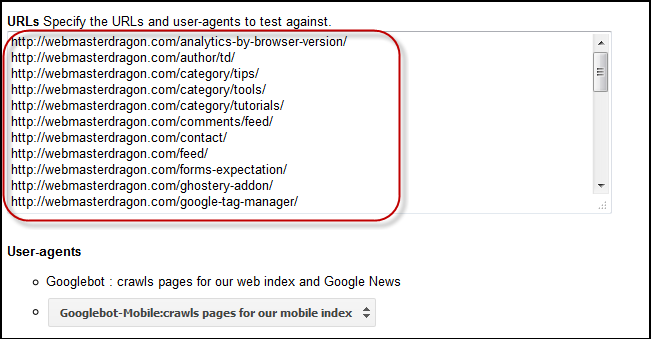 Scroll down the page to the URLs Specify the URLs and user-agents to test against section and paste in your URL list. Note: I’ve been able to paste in 200 URLs at a time in this text field. Select which User-agents you wish to emulate. You can rerun the test and choose different agents. This test only indicates if the crawler is allowed access. You should see your URL list and the status for each User Agent. Note any errors such as URLs that were blocked. In the example below, you can see that Googlebot was blocked because of line 2 in my robots.txt file. Edit your robots.txt to fix any errors and test again. If you changed your robots.txt, make sure to copy the file to your production web server.